During International Nestle-Free Week 2012 (29 October - 4 November) people have been sending messages to Nestle about its systematic violations of baby milk marketing rules and signing a petition of solidarity with the people of the Philippines. A message of thanks has just been received from campaigners in the Philippines (see below). Nestle-Free Week is a time for for people who boycott Nestlé over the way it pushes baby milk to do more to promote the boycott - and for those who don't boycott to give it a go. Above: Gloria joined the successful campaign with her son Miguel in 2007. Mothers and babies need your help again. Please sign the petition of solidarity. This is helping bring attention to this issue - see, for example, this report in the Philippines on 23 October 2012. Questions are being asked about the influence Nestle is using to gain support from the Department of Trade and politicians who are facing an election next year. 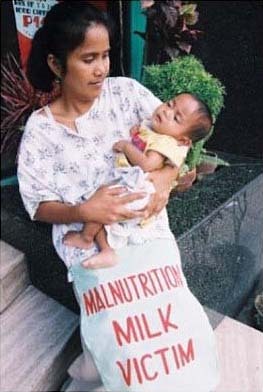 On 4 September 2012, Baby Milk Action received the following message from MOM CARE - Movement Opposing Milk Code Amendments and Revision, the new name from the Breastfeeding Consortium in the Philippines. "Thank you for your commitment to the campaign. Thank you for your kindheartedness. Nestle never sleeps and greedy Nestle will never stop amassing profits from the poor people in the Philippines who have large families as their consumers. Nestle leads IPNAP a conglomerate of Nestle-Wyeth, Mead Johnson, Abbott and Fonterra multinational milk companies who dangle gifts of any sorts especially to the lawmakers/lawbreakers in Philippine Congress to weaken the Milk Code law and replace with a pro-Nestle vested interest Monster Bill. Now, it is election time for politicians and the big question how much influence peddling was contributed to the election money bag? Recently, IPNAP's government ally the Department of Trade and Industry was on the news last week "DTI bucks the amendment Bill in the name of informed choice for lactating mothers". DTI mimics Nestle stand. 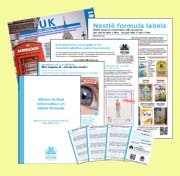 Nestle style is to sow confusion by letting the Department of Health and DTI fight each other. DOH issued a media statement with UNICEF and WHO, "ban babymilk ads till 36 months old" IPNAP and DTI chorused, "ban babymilk ads till 6 months old" thereafter free wheeling promo lies. We call on our global partners to defend breastfeeding vigilantly because Nestle creeps in every legislative process to wreck breastfeeding initiatives in every country. Nestle masquerade as pro-breastfeeding but in truth undermines it by pushing policymakers to make a law that will favor their economic interest and not the consumers. They bleed the consumers to illness, poverty and death. Playing with national legislation is their new trick in Vietnam, Kenya, Hongkong, Philippines etc. Keep Nestle away from your home, away from your life, away from your generation's future. It is not good food, good life as Nestle promise, it is in fact Bad life after all.